His early musical wanderings began with violin as a student in the Suzuki method. He credits this experience, along with attending numerous concerts of his father's (a collegiate choral and orchestral conductor,) with developing his perception and processing of music basically as a second language. He came to realize that if the "ear" is developed, the actual act of playing an instrument is simply typing - getting the right fingers in the right place at the right time. He put this to use throughout his public school education, first adding piano to his skills, then the french horn, then upright and electric bass. His high school career culminated with him serving as the concertmaster for his school orchestra, principal horn in the wind ensemble, bass player in the jazz band, singing in the choir, and in being elligble by audition for three of the Pennsylvania All-State ensembles (band, chorus and orchestra) his senior year. In 1987, David enrolled at the Eastman School of Music in Rochester, New York, as a double degree student in music education and french horn performance. He studied with horn teacher Verne Reynolds, and had Dr. Richard Grunow as his primary music education professor. While at Eastman, David continued to add new instruments to his repertoire, eventually needing to keep two instrument lockers at the school to house them all. In particular, he became interested in the performance of early Renaissance music on original instruments through the school's Collegium Musicum ensemble. In that ensemble he added viol da gamba, cornetto, crumhorn and bass recorder to his list of performed instruments as he worked under the direction of Paul Odette (lute) and Christel Thielmann (gamba). At the same time, David also started introducing himself to the world of electronic music and music technology in the school's computer lab with the first generation of Mark Of The Unicorn's software, Professional Performer and Professional Composer. This connection to music technology has remained a primary focus of his to the present day. David graduated from Eastman in 1991 with highest honors. After leaving Eastman, David spent close to ten years persuing his other main love, technical theater. He worked at several theater companies as a carpenter and lighting technician, and went on the road for a year with a national tour of the musical, "Gypsy." On the road, he met his wife, Lisa, who was the wardrobe supervisor for the tour. They moved to Connecticut in 1992, initially working as free-lance theater technicians, and eventually both getting hired at the Hartford Stage Company. David eventually became the lighting and sound supervisor there, and was a part of the company until 1999. While working his "day job" in theater, he continued to work as a performing musician, focusing his energies into the electric bass. He played in several bands in the Connecticut area, including cover bands, jazz bands, and original instrumental groups. Most notably, he was the bass player for the band "Fretwater," an instrumental quartet that featured banjo player Ron Cody, and played jazz-influenced original music in the New England region. David continued his work on other instruments as well, and also became more focused on the technology side of music and music production. In 1999, David decided to return to music full time, and, after completing his teaching certification in Connecticut, was hired by Regional School District #10 in the towns of Burlington and Harwinton, Connecticut. In the eight years that David has been a part of the district, he has taught every grade level (except 5th, for some reason), and has taught every aspect of music, from general classroom music at the elementary level, to music theory and electronic music at the high school level. He has been a major force in bringing technology to all aspects of the fine arts department of the district, helping to create various music technology classes, developing and managing the department website, and acting as the technical director for the performing arts facility at the school. He currently teaches concert choir, music theory, music appreciation, electronic music, recording technology, and stagecraft, and is developing a new rock / pop ensemble class that will begin in the 2011-2012 school year. He is also working to become a leader in the district for technology in classroom, and to that end he completed a masters degree in educational technology at the Central Connecticut State University in 2009. 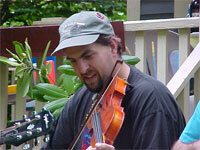 His current performing focus is the mandolin, which he moved to several years ago after decades of work on the violin. His current performance project is "Prester John," an acoustic guitar / mandolin duo with guitarist extraordinaire Shawn Persinger. The pair released their first full-length album in the summer of 2010, entitled "Desire for a Straight Line." The album, which features 16 original instrumental compositions, was released through the Innova record label, and has been receiving much positive press from a wide variety of media outlets. In addition to his work with Prester John, David has also been developing a unique "solo style" of performance on the instrument, and has been a part of several other groups, including the trio, Shoulda, Coulda, Woulda, with fellow music teachers Andy Mayo and Jeff Rhone. He is also looking forward with great excitement to being able to bring the world of music to his new daughter, Maizie, who has already shown an interest at the age of one in several percussion instruments, and in the Autoharp. David truly feels that there are things to learn from EVERY aspect of music and music performance in the world, and is constantly looking for the next musical tidbit to catch his ear.